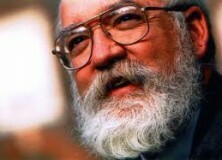 Still thinking about Dan Dennett’s conception of memetics. He’s got an article in the Encyclopedia of Evolution (Oxford 2005), “New Replicators, The” that’s worth looking at. …evolution will occur whenever and wherever three conditions are met: replication, variation (mutation), and differential fitness (competition). In Darwin’s own terms, if there is “descent [i.e., replication] with modification [variation]” and “a severe struggle for life” [competition], better-equipped descendants will prosper at the expense of their competitors. We know that a single material substrate, DNA (with its surrounding systems of gene expression and development), secures the first two conditions for life on earth; the third condition is secured by the finitude of the planet as well as more directly by uncounted environmental challenges. Finally, a note on how my thinking about cultural evolution differs from Dennett’s. Those who’ve been memetics by the bug have two conceptions to choose from, both of which can be found in Dawkins. One can think of memes as cultural analogus to biological viruses or one can them of them as analogues to genes. Dennett chooses the former while I choose the latter. So I must also make a proposal about the cultural analog to the phenotypes in the biological model, and I have done so in various places (e.g. in the case of music, in Beethoven’s Anvil, and more generally HERE and HERE, which I’ve bundled into these notes HERE). While I have my reasons for doing this, I’m wondering if I could make a really strong argument, one the might even capture Dennett’s attention? I don’t know. Here’s a quick thought or two, but not yet an argument. One issue that’s come up in memetics discussions – here I’m thinking of some online discussions that took place on a memetics listserve back in the late 1990s – starts from the observation that cultural phenomena exist as relatively small things, like bricks, words, and notes, and relatively large things, like cathedrals, novels, and symphonies. How do we treat that? Some call the little things memes and the big things memeplexes. If you do this, then you don’t need special cultural analog for phenotypes as memeplex seems to fill the bill. Others, like me, want to think of the relatively large entities as cultural phenotypes (I don’t know of any word that’s been specifically coined to fill this conceptual slot). However, while it is true the genes are smaller than phenotypes, even for the smallest cell, the distinction isn’t merely one of size. More importantly, it’s one of function. Yes, in phylogeny, genes replicated from one generation to the next. In ontogeny, however, and in ongoing maintenance, they code for the proteins out of which organisms are constructed and they perform roles in regulating that construction. It’s this distinction, in function, that’s important to me. That’s the argument I’ve been pondering the last few days: How do I argue for a functional distinction between memes and cultural phenotypes? In particular, how do I formulate that distinction in the case of language? Can I argue, for example, that phonemes are memes, while words themselves are phenotypes? And when I talk of words in that previous sentences I don’t mean morphemes, but fullblown words, including syntatic, semantic, and pragmatic features all “anchored” by a string of spoken syllables or written letters. And if I can make that argument, what would it take to generalize across all of culture? The menes~=genes or memes~=viruses debate seems dead to me. Memes~=genes, but genes can be part of parasites, mutualists and commensals – and so can memes. I don’t see any real meme enthusiasts debating this. Some are more enthusiastic than others about the link to viruses. Ben Cullen was positive – with his Cultural Virus Theory. However, for others, the implications of being deleterious to the hosts are too strong for all memes to be classified as viruses. “Phemotype” is one version of “phenotype” used by some memeticists. I prefer to use “gene products” and “meme products”. The simplest and best way to manage the meme/product split, IMO, is to say that genes/memes consist of inherited information, while gene and meme products are everything else which they affect. I agree, the virus/gene debate is dead, at least in the sense that no one’s arguing the issue. But there IS an issue there and it has to do with what entity is the direct target of cultural selection. If you make the functional distinction that I want to make, then it is the cultural phenotype that is the direct target of selection while the memes are only indirectly targeted. As Dennett doesn’t make such a distinction, at least not in the articles I’ve been reading (which are quite recent) I assume that, by default, his position is that the memes, the inherited information, is the direct target of selection. I think that question has to argued fairly close to real examples considered in some detail. That’s difficult to do and I haven’t seen it in any of the memetics literature I’ve read. Previous Previous post: The best ‘broken telephone’ picture?